The Heat-Seeking Rocket Launcher is a handheld weapon in Grand Theft Auto: San Andreas. Unlike the Rocket Launcher, the Heat-seeking Rocket Launcher automatically selects the nearest available target. Strangely, when it's on the ground it resembles a Russian SA-7 Grail but when CJ picks it up it turns into an FIM-92A Stinger. When pointed at a vehicle the marker is green. After waiting for 3-5 seconds it turns red and the missile is locked on. The Heat-Seeking Rocket Launcher locked on to a target. Hydras also have heat-seeking missiles. 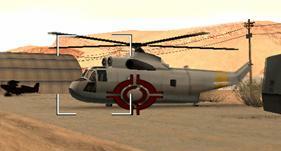 As it is a heavy weapon, the player is unable to sprint or jump when using the weapon. They are employed by the NOOSE in The Ballad of Gay Tony, although the player can not access them in any way. It has been speculated that the "heat seeking" rockets are just rocket projectiles spawned and scripted to aim for Luis's vehicle, together with officers wielding RPGs to create the effect. HUD icon for the weapon. The ground model for the Heat-Seeking Rocket Launcher which is unrealistically short for the SA-7 Grail it's suppose to be. A real SA-7 Grail which is seen in the ground model. An FIM-92A Stinger in real life seen when CJ picks up a Heat-Seeking Rocket Launcher. This page was last modified on 1 January 2013, at 03:45.